Find the Pioneer pump that best meets your needs using our Pump Selector. 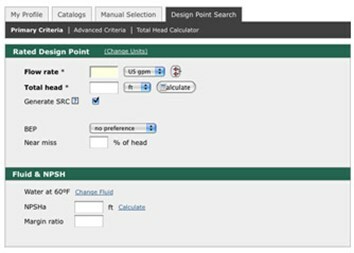 Simply select your system design point, fluid properties, motor sizing and NPSH ratings from the choices below, and the Pump Selector creates a dynamic pump curve. From there, you have the ability to trim impeller diameters, adjust operating speeds and save the data sheet as a PDF. The Pump Selector also includes a Total Head Calculator, a full lifecycle cost analysis and the ability to request a quote based on your specs. Please note the Pump Selector is for estimating purposes only. All your selections should be confirmed with Pioneer Pump. Also, while this tool contains a great number of options, it is not comprehensive. If you do not find the selections you're looking for, please don't hesitate to contact us.